We're installing our brand new and homemade entrance door! 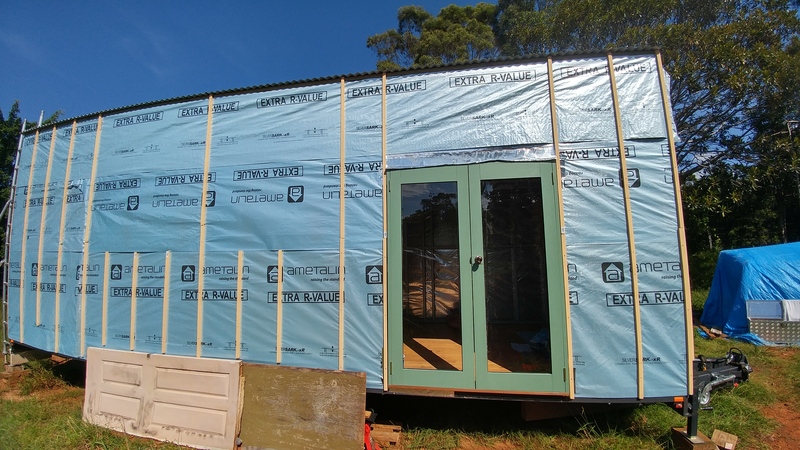 Today, we are installing the entrance door to our tiny house!! We’re super excited about this because we spent the last three weeks building the french doors ourselves. 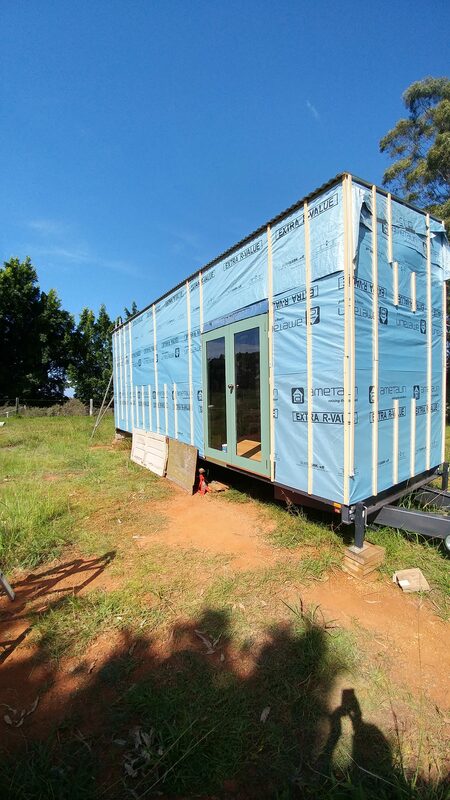 We chose french doors for our tiny house because obviously, they look very nice. But in our case, they will also function as additional windows because we chose single light doors which will let in heaps of light. This should make our tiny house look spacious when inside. 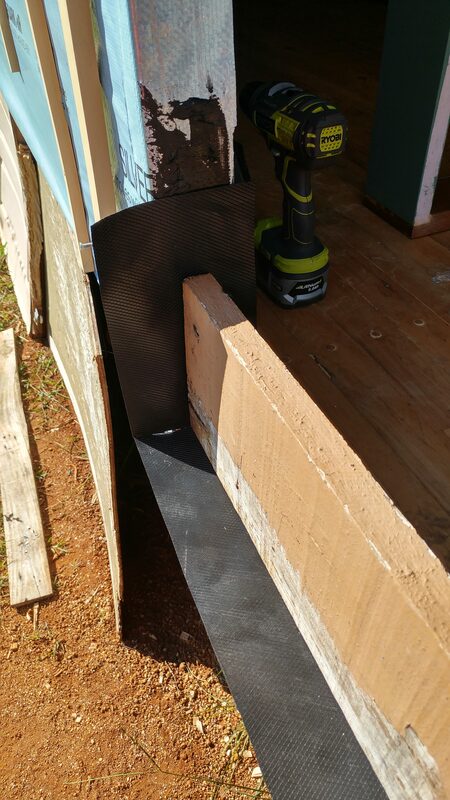 How to install an entrance door to a tiny house? So, prior to installing our french doors, we spent hours watching videos about how to install an entrance door. It’s actually not that complicated and pretty straightforward. 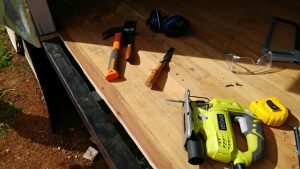 When preparing this blog post, I counted five steps that are necessary to install an entrance door in a tiny house (any house, really). Step 1: Cut open the paper and fold it around the steel beams. The first thing you will have to do is cut open the building wrap. Start at one of the top corners and go down at a 45° angle. Don’t worry, this doesn’t have to be accurate. Stop when you hit the centre. Repeat this step for the other corner, then from there cut straight down along the middle. Now you have to fold over the building wrap around the steel beams. To hold the paper in place use double-sided tape or spray glue. When fixed to the steel beam, cut off the excess building wrap. Repeat this for the sides and the top of the frame. Step 2: Tape the top corners of the steel frame. 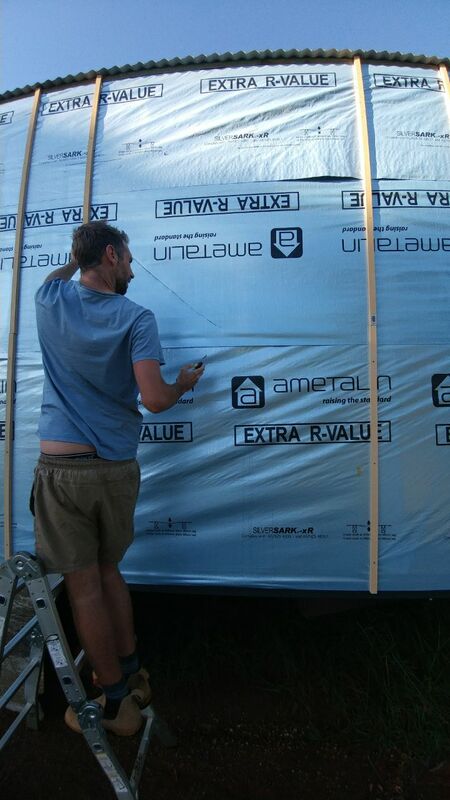 In order to prevent water from dripping into the house, you have to tape the top corners of the steel frame. Water should not be able to get through the door frame in the first place because flashing, exterior cladding and guttering should prevent this. This step is just an additional precaution. 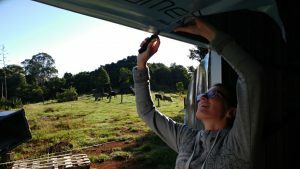 In the videos we watched, people used window flashing tape. Unfortunately, we couldn’t find this here in Australia. 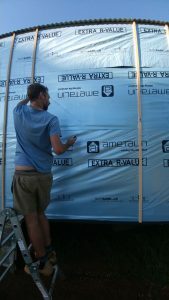 So, we went with weatherproof tape. This kind of tape is usually used for temporary fixes but since the tape won’t be exposed to the elements, we’re hoping to get away with it. Start with cutting off a 30 cm long strip of tape. Place it along the steel frame at one of the top corners and make sure that the tape runs about 15 cm on each side of the corner. Align the tape with the inner side of the steel frame and stick it on. Make sure that there are no air bubbles and that the tape is straight. Then cut it in the centre and fold over the excess tape. Cut off another smaller piece of tape, about 6 cm, and stick it over the corner you just did. The tape should overlap the corner by about 1 cm. This is to make sure water just runs off instead of into the house. Have a look a the photos for a more visual explanation. Repeat this process for both corners. Step 3: Cut our the floorboards to make room for the door sill. You might not need to do this depending on your floor or perhaps you allowed for your entrance door before you installed the floor. We didn’t, so we had to cut out some of the floorboards we laid earlier. This step is quite simple. Measure your door sill and mark exactly how much of the floor needs to be cut out and then, cut it out. We used a combination of hand and jig saw. But again, this depends on your floor. Step 4: Add flashing to the bottom of the steel frame. This is another step to prevent moisture from getting into your house and it will also protect the door sill. 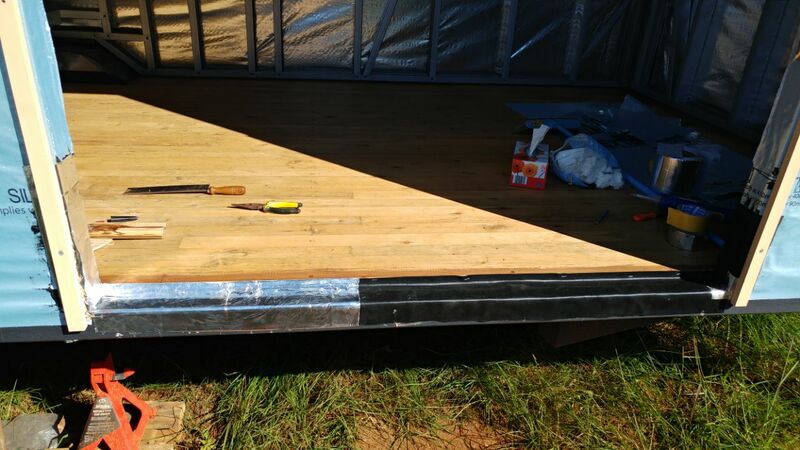 We used a combination of DPC, which we already used for under our floorboards and weatherproof tape for our flashing. 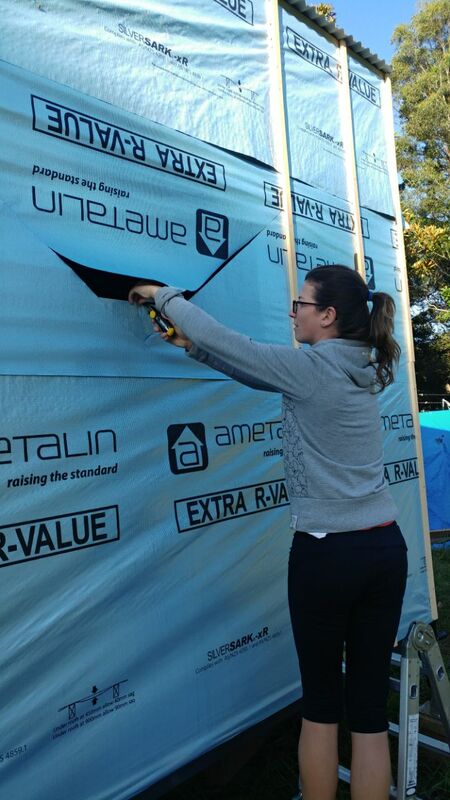 Initially, we just wanted to use the DPC but it’s not very flexible and so it broke in one corner. Also, because of its thickness, it took away some mm and the outer door frame wouldn’t fit anymore. So, what we really did here with the weatherproof tape was troubleshooting. 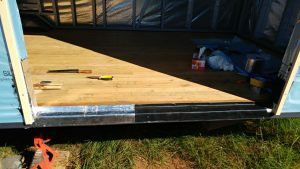 To install the flashing, simply fold it around the steel beam, starting at the edge of the floorboard. We used liquid nails to glue down the DPC. 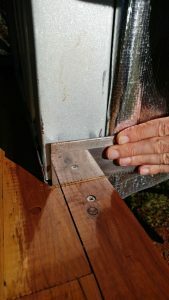 The weatherproof tape is adhesive and will just stick to the steel. Let the adhesive dry completely before proceeding. Step 5: Bolt on the outer door frame to the steel frame. Once the flashing is in place and dry, carefully insert the outer door frame into the gap. There should be tiny gaps of about 5 mm or less on each side of the frame and on the top. 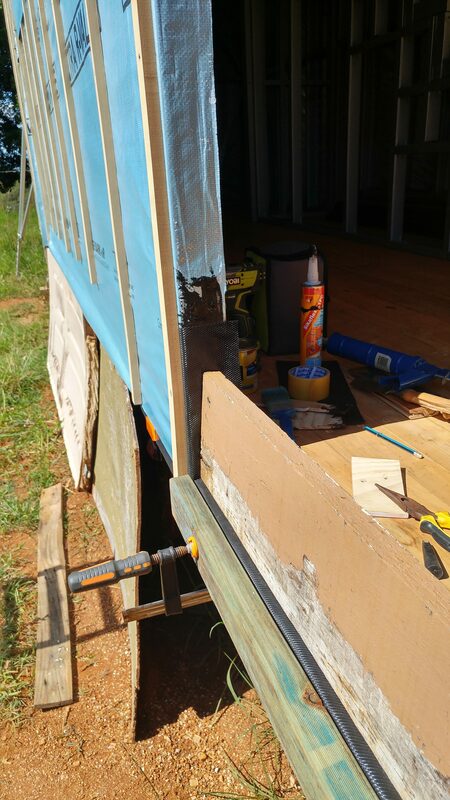 You will need those gaps to shim the doors into their final position making sure they are 90°. 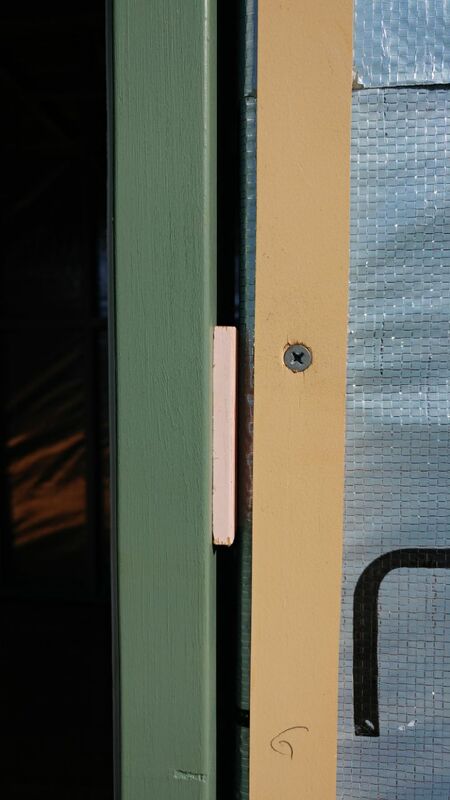 You have to allow for those gaps when buying or building your entrance door. Before you bolt on the door frame, make sure that the doors are closing properly without scratching the door sill or the frame. Adjust if necessary and use small wooden pegs to shim the door frame in place. 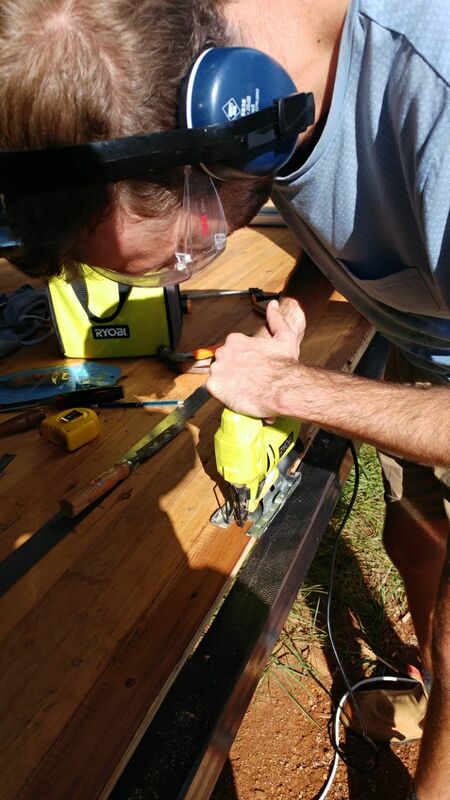 Once the door frame is in place, bolt it onto the steel frame where the wooden pegs are. That’s it! You’re now able to enter your house through the entrance door! It’s amazing what we can achieve if we want to! 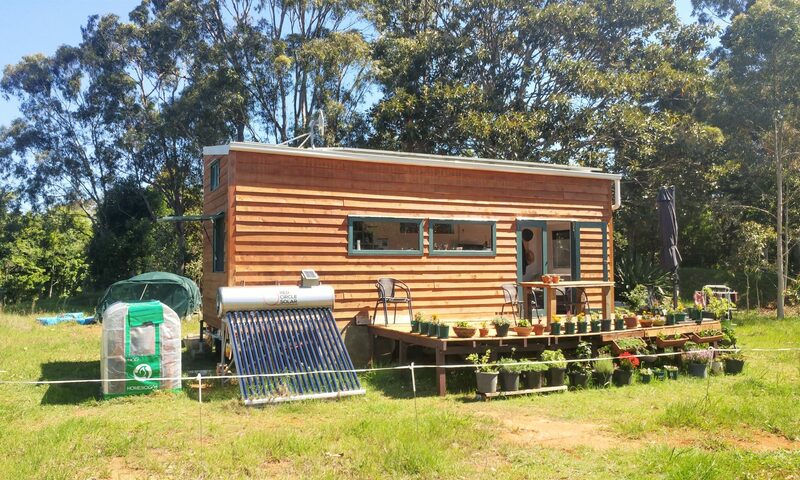 I’m very proud of our achievements with the tiny house build so far. Both, Paul and I, have never done anything like this before in our lives. We’re rookies with everything related to building a house and carpentry. Luckily, we’re living in a time where we can look up almost everything online. This seems to work quite well for us because so far we didn’t have any major hiccups. This whole experience shows me that we all can achieve anything we want if we’re willing to learn and to give it our best shot! 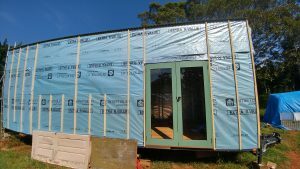 Previous PostPrevious We are building the french doors for our tiny house!